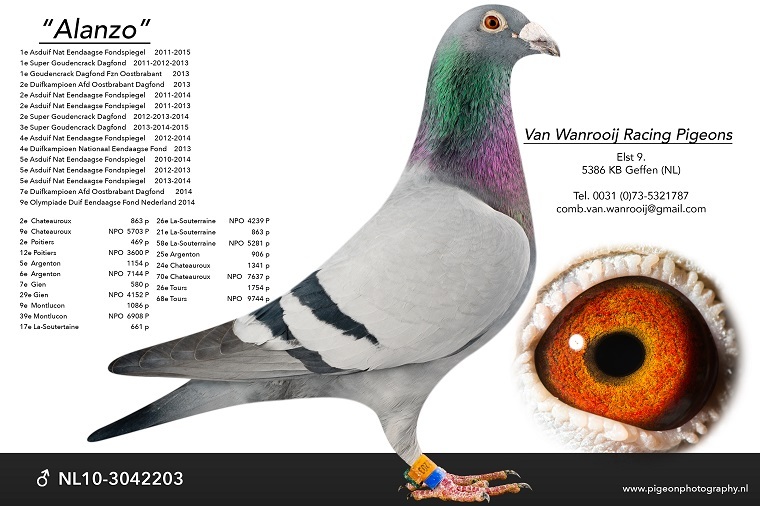 The one year old Fellaini of the Van Wanrooij combination had already won an 8th NPO of 3,584 pigeons from Argenton earlier on, and he continues to show his great potential in the one day long distance, now claiming a 1st NPO of 2,468 pigeons. 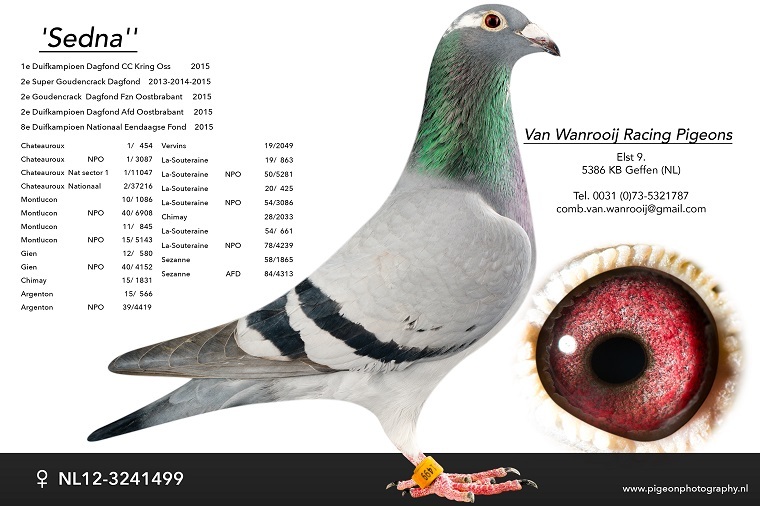 Like we said, this talented young pigeon had already won an 8th NPO of 3,584 pigeons in Argenton on 9th of June. 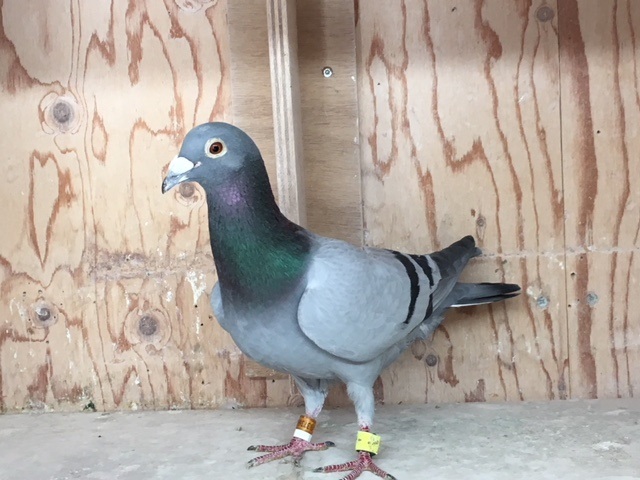 And he got himself noticed again in the rather demanding race from La Souterraine on 7th of July, claiming a 1st NPO of 2,468 pigeons (as the fastest of Sector 1B of 3,667 p.) over a distance of 677km, and with a speed of 1,140 m/min. It is worth noting that no more than 9 pigeons reached a velocity of over 1,100 m/min. This pigeon was raced in the natour competition as a young bird, and he was basketed for Orleans that season as well. The champions breed champions theory clearly applies to Fellaini, as you can tell from his pedigree. Both his sire Alanzo and his dam Sedna were very talented racing birds, and they were particularly successful in the one day long distance. Zoals reeds gezegd speelt deze jonge belofte op de NPO vlucht Argenton van 9 juni jl. reeds een 8e tegen 3.584 duiven. Nu op de beslist niet makkelijke La Souterraine van 7 juli speelt hij zich opnieuw in de kijker met een 1e NPO tegen 2.468 duiven (tevens snelste Sector 1B van 3.667 d). Op een afstand van 677 km. pakt hij met een snelheid van 1.140 m.p.m. deze overwinning, en maar 9 duiven wisten de 1.100 meter grens te overschrijden. Als jong werd hij op de natoer gespeeld en tevens is hij in dat jaar ook mee geweest naar Orleans. Het gezegde "de goeie komen uit de goeie" is bij Fellaini zeker van toepassing zoals u hier op de pedigree kunt zien. Zowel vader Alanzo als moeder Sedna wisten wat kopvliegen was en waren beiden van uitzonderlijke klasse op de dagfondvluchten. 9th NPO Chateauroux    5,703 p.
12th NPO Poitiers       3,600 p.
6th NPO Argenton       7,144 p.
29th NPO Gien           4,152 p.
39th NPO Montlucon      6,908 p.
26th NPO La Souterraine 4,239 p.
58th NPO La Souterraine 5,291 p.
70th NPO Chateauroux    7,627 p.
68th NPO Tours          9,744 p.
40th NPO Montlucon      6,908 p.
15th NPO Montlucon      5,143 p.
40th NPO Gien           4,152 p.
39th NPO Argenton       4,419 p.
50th NPO La Souterraine 5,281 p.
54th NPO La Souterraine 3,086 p.
78th NPO La Souterraine 4,239 p.
84th NPO Sezanne        4,313 p.
Rien Clement has been the combination's loft caretaker for an impressive 12.5 years. He has now turned 66, and he is set to go into retirement soon. 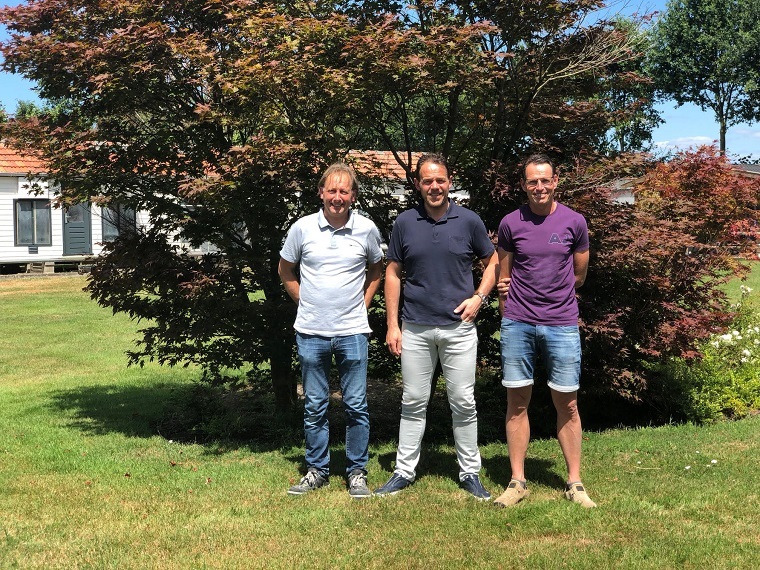 John Vos will be the new right-hand man of the Van Wanrooij combination, which now consists of John van Wanrooij, Henri van Doorn and John Vos. Meanwhile, a team of young birds has been racing successfully from the home of Henri van Doorn in Den Dungen in recent years, under the name of Doorn van Wanrooij. And John Vos will be racing his own team of birds at home as well, competing mainly in the ZLU competition as Vos van Wanrooij.